Jurors in the trial of Boston Marathon bomber Dzhokhar Tsarnaev have resumed deliberating over whether he should be sentenced to life in prison or the death penalty. 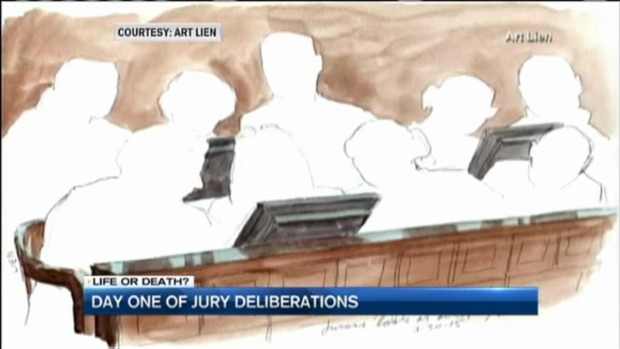 Jurors deliberated about 8½ hours Wednesday and Thursday without reaching a verdict. They resumed deliberations Friday morning. The jury must weigh any mitigating factors that Tsarnaev's lawyers say support their argument for life in priJurors in the trial of Boston Marathon bomber Dzhokhar Tsarnaev have resumed deliberating over whether he should be sentenced to life in prison or the death penalty. Jurors considering the fate of Boston Marathon bomber Dzhokhar Tsarnaev deliberated all day Thursday without reaching a decision. The jury must weigh any mitigating factors that Tsarnaev's lawyers say support their argument for life in prison against any aggravating factors that prosecutors say support their call for the death penalty. Seventeen of the 30 charges Tsarnaev was convicted of carry the possibility of the death penalty. Three people were killed and more than 260 were injured when two pressure-cooker bombs packed with shrapnel exploded near the marathon finish line April 15, 2013. A Massachusetts Institute of Technology police officer was killed days later.son against any aggravating factors that prosecutors say support their call for the death penalty. Three people were killed and more than 260 were injured when two pressure-cooker bombs packed with shrapnel exploded near the marathon finish line April 15, 2013. A Massachusetts Institute of Technology police officer was killed days later.